M.H. McCarthy & Co., Haverhill, Mass. Michael H. McCarthy arrived in Haverhill, Massachusetts in 1870 at 16 years of age following his father's death. Within two years, McCarthy went into business on his own. He was born in Arlington, MA in 1854 to Michael and Hannah McCarthy. The family moved to Lawrence, MA in 1863 where Michael began working in the textile mills. It is believed by 1891 or possibly earlier, McCarthy began distributing liquor. He remained in business at 61-65 Essex in Haverhill until Prohibition was enacted. M.H. McCarthy & Co. distributed Bellwood Rye and Kenoza Club Whiskey. C.H. Ritter & Co., Detroit, Mich.
C.H. Ritter & Co. was established in 1882 by Charles H. Ritter and Canadian-born Edwin August Burch. 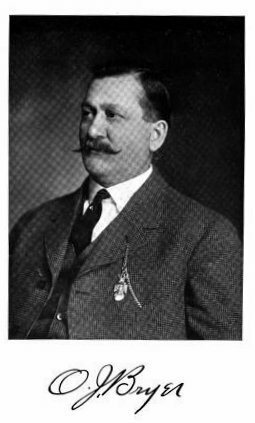 Born on January 12, 1857, Burch became a partner in the company as a traveling salesman and also acted as the company's president. Less is known about the early life of Charles H. Ritter. It is known however, that Ritter entered the 5th Michigan Infantry as a private and became 1st Lieutenant and Adjutant in October 1864. While in battle, Ritter went missing at Chancellorsville and was presumably a POW before "returning to the regiment October 8, 1863." Prior to establishing C.H. Ritter & Co., Ritter worked for M.H. Chamberlain & Co.. Marvin Howard Chamberlain and his brother A.H. Chamberlain launched the company in November 1867. It is unclear when Ritter joined Chamberlain, but his name in association with M.H. Chamberlain & Co. appear in Detroit City directories as early as 1875. C.H. Ritter & Co. was located at 25 Monroe Avenue in downtown Detroit. The company was incorporated in 1907 and moved to a large three story building at 142-144 Jefferson Avenue where it prospered until Prohibition went into effect in Michigan in 1917. Manderscheid Sons Co. was a wholesale liquor merchant in Sioux City, Iowa during the early 1900s, and sole agents for Pabst Brewing Company beers. The company was owned by John Manderscheid and his two sons, Henry, and John H. Manderscheid. John Manderscheid was born in Lemars, Iowa on January 11, 1877 to German-born parents. He worked in agriculture and later the hotel business prior to establishing a saloon in Sioux City in 1889, at the corner of Second and Virginia Streets. In 1894, the company was moved to 314 Fourth Street. John Manderscheid (Sr,) was President, Henry, secretary, and John H., treasurer. In 1905, John Manderscheid along with James F. Booge, and John Arensdorf secured $80,000 in cash subscriptions in stock to erect the Northwestern Brewery in Sioux City. German-born Julius A. Schuller was a well known wine merchant and wine connoisseur in Indianapolis, Indiana. He was born in 1847 and relocated to Indiana in 1873 from California where he had resided for seven years in the wine growing regions of the state. He was noted for being an "expert in wines." The 1895 Indianapolis Illustrated described he and his business as; "One of the best known houses thoroughly representative in its special line is that of Julius A. Schuller wholesale and retail dealer in California wines, brandies, etc., and importer of foreign wines and liquors." It went on to say; "The cellar is fitted up as a vault, and here is stored wines of the finest vintages to be obtained. The stock carried is large, and comprises the choicest and best white, red and sweet wines from Sonoma and Los Angeles counties (California) vinyards; also champagnes and cognac brandies, together with Ohio dry and sweet catawba wines, and the best productions of Germany, France and Italy." Schuller is listed in directories as operating under the name J. A. Schuller from 1886-1887, Julius A. Schuller & Company from 1889-1890, and Julius A Schuller from 1891-1917. The date and address of his business was listed as 67 N. Illinois from 1886-1887, 1 E Washington in 1889, 81 E Court from 1891-1893, 106-108 N. Meridian from 1894-1895, 110-112 N. Meridian in 1897, 210-212 N. Meridian from 1898-1914, and 125-127 E. Ohio from 1916-1917. The Bundes-Turnfest was a German gymnastics festival held in Indianapolis in 1905. The German verb "turnen", means “to do gymnastic exercises.” Frederick Ludwig Jahn established the first turnplatz for physical training in Germany in 1811. Jahn’s training field was said to have been designed to "develop physical fitness and national pride among German youths." Over the years, Turner organizations were established throughout Germany. The clubs promoted the philosophy that a strong mind and a strong body makes a strong, worthwhile citizen. In 1848, the first "turnverein," or Turner’s clubs, were established by German immigrants in Louisville and Cincinnati. Copyright © 2010 Ed Sipos. All Rights Reserved.